Researchers in the Molecular Biophysics and Imaging group are investigating structure, dynamics, and function of biomolecules in physiological and in-vitro settings, as well as developing techniques to follow physicochemical processes at cellular and organism levels. Research groups at TIFR possess expertise in an array of different experimental techniques such as NMR (solution and solid state), Fluorescence spectroscopy, Ultrafast spectroscopy, and Atomic Force Microscopy, coupled with synthetic labeling/tagging techniques. High performance computational methods are also routinely used to study molecular/biomolecular properties. 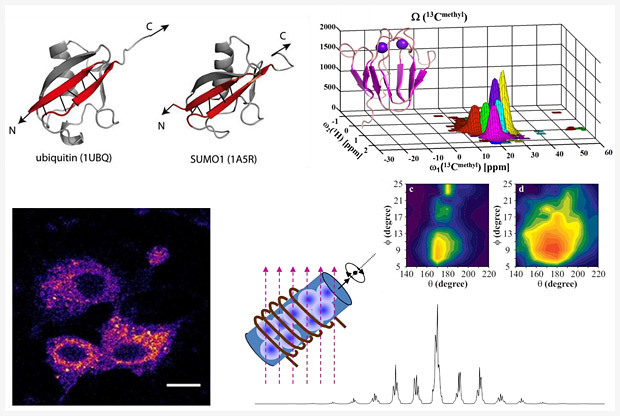 Areas of research include studies on protein aggregation, biomolecular structure determination, protein allostery, and development of “turn-on” small molecule sensors to follow physicochemical processes in-vivo.